The Marbelite Company, Inc., 26 Warren street, New York, manufacturers of traffic signals, an associate of Atlas Safety Equipment Company, have announced the purchase of the Traffic Signal & Control Division of the Signal Service Corporation of Irvington and Elizabeth, N. J., and the removal of the entire equipment to their New York plant. 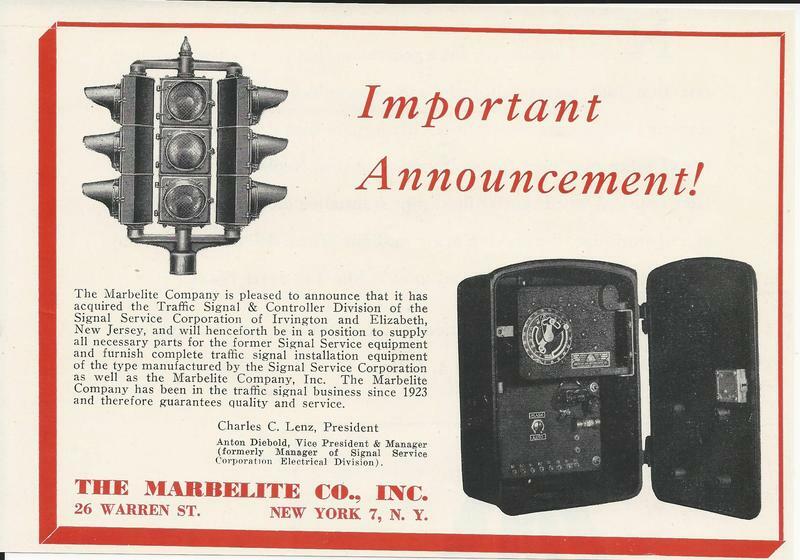 The announcement states that the company will continue the manufacture of controllers, signal heads, and signals formerly manufactured by both the Signal Service Corporation and the Marbelite Company, Inc.
Anton Diebold, formerly manager and engineer in charge of the Signal Service Traffic Signal Division, enters the Marbelite Co., Inc., as vice president and manager. Charles C. Lenz is president of the Marbelite Company Inc., which has been active in this line since 1923. The acquisition of the Signal Service Corporation’s Signal Division and patents now permits the Marbelite Company, Inc., to supply all necessary parts tor the Signal Service traffic control signals including the variable speed timing mechanisms as well as complete traffic signal equipment of the type manufactured by both organizations.